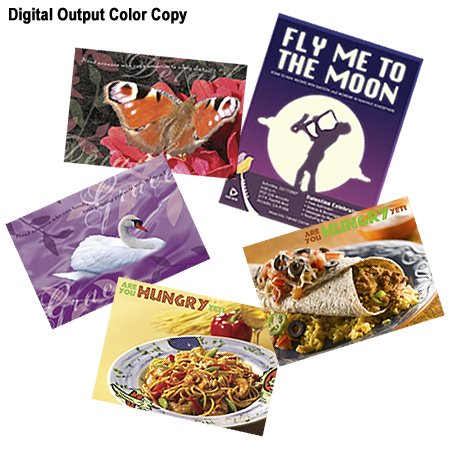 Color Digital Copies - ADD HIGH IMPACT WITHOUT THE HIGH COST! In today's competitive environment, color isn't a luxury. It's a necessity! Research shows that you get 65% more response by employing colorful, eye-popping graphics! Color attracts. Color is expressive. That's why color sells! You can gain the competitive edge with our digital color printing and copying. It's an impactful, affordable alternative to full-color printing at lower quantities. Just bring us your originals, or we can output your documents directly from your digital files. Even easier, you can upload your file through our website. If you're not sure what to do, give us a call or email us and we'll be glad to walk you through the process.